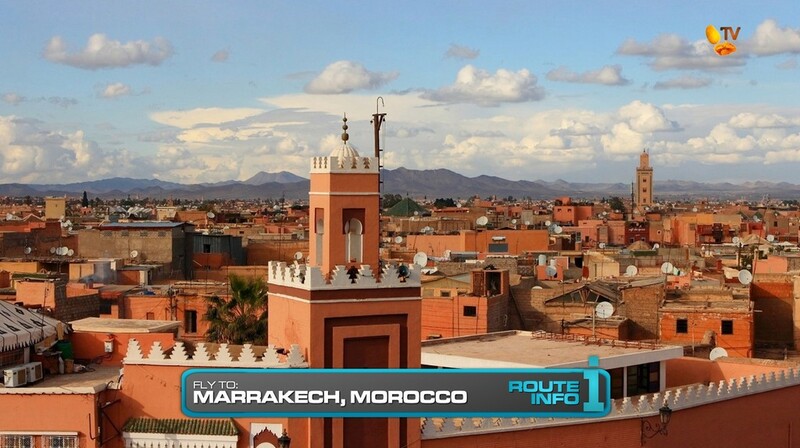 Leg 4 begins as the first clue reveals the teams’ next destination is Marrakech, Morocco. 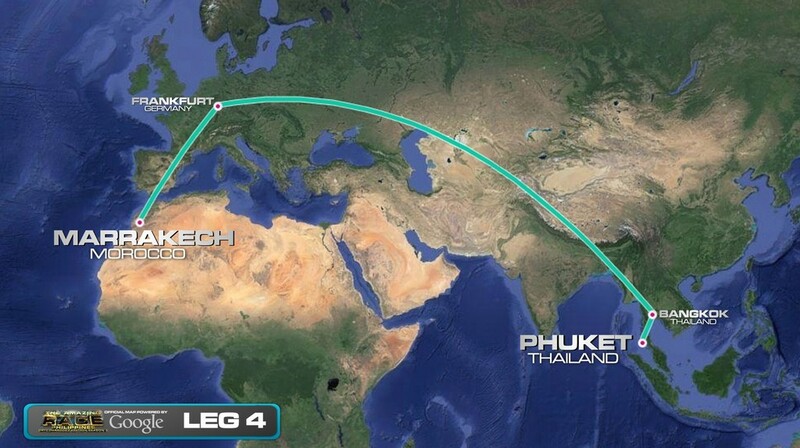 Teams will be given tickets must secure flights via Bangkok and Frankfurt, Germany getting them into Marrakech at 1:40pm. 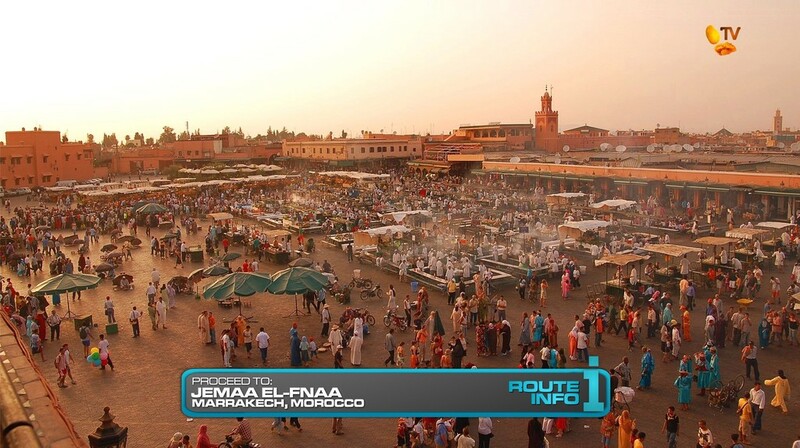 Once in Marrakech, teams must make their way to the Jemaa el-Fnaa marketplace where they will search for a marked food cart garage for their next clue. 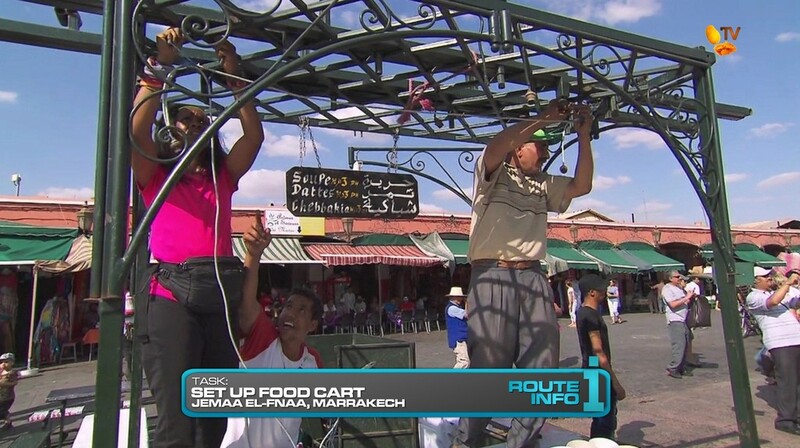 That clue instructs teams to help local food vendors roll out their restaurant carts and set up shop in the square. When the owner feels the cart is ready for business, teams will get the next clue. Teams must now make their way on foot to the Bab Debbagh Tannery for their next clue. And that clue reveals the Double Road Block: Who wants to pull and who wants to push? For the team member who wants to pull, they must finish removing the hair from five goat hides. BUT! Before tagging in their partner, teams must stop at the Double Yield board. For the team member who wants to push, they must deliver five bundles of already prepared hides by bicycle to a local cobbler who will hand them a receipt that they will exchange for a clue back at the tannery. After the Road Block, teams will encounter the Detour: Down on the Floor or Up on the Wall. 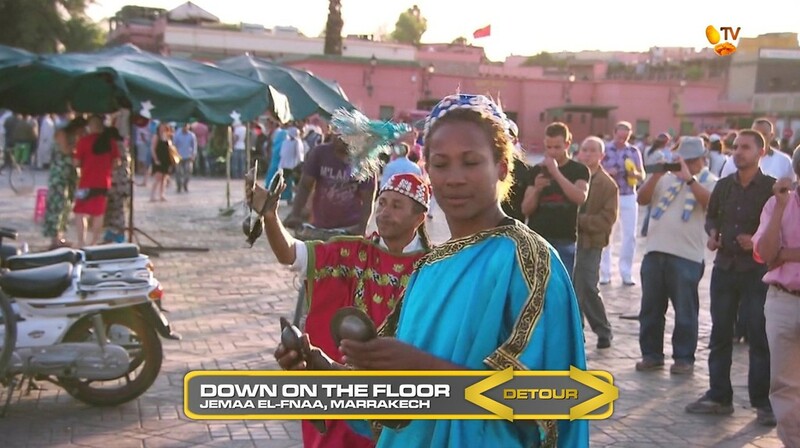 In Down on the Floor, teams will join a gnawa dance troupe. After picking up costumes and instruments at Bob Magic Music, they will join the troupe at Jemaa el-Fnaa to perform. Once team member will play a drum while the other played the krakeb while twirling a tassel on their hat. If they can continuously twirl the tassel for one minute, they’ll get the next clue. In Up on the Wall, teams must head to the Al Matjar Carpet Shop where they will search the thousands of carpets for five matching a carpet sample which they will choose. Once they’ve found the carpets, they must then deliver them to the Riad Monceau Hotel where they will hang the carpets to prepare them for sale. Once they’ve properly hung the carpets, they’ll receive the next clue. 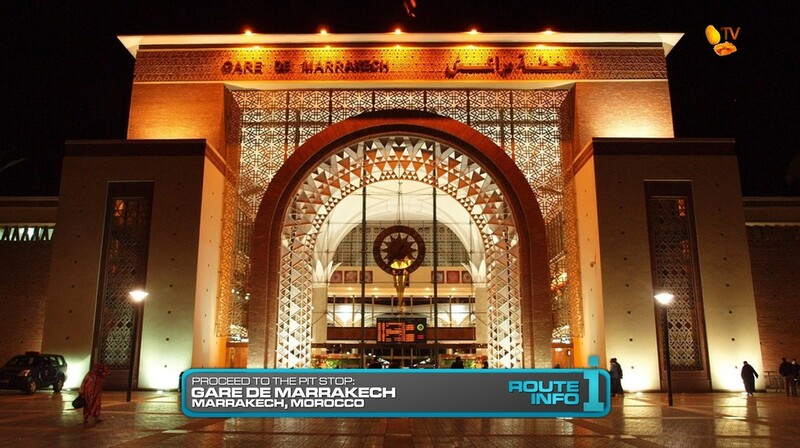 And that clue directs teams to the Pit Stop, Gare de Marrakech, the southern terminus of the Moroccan railway. 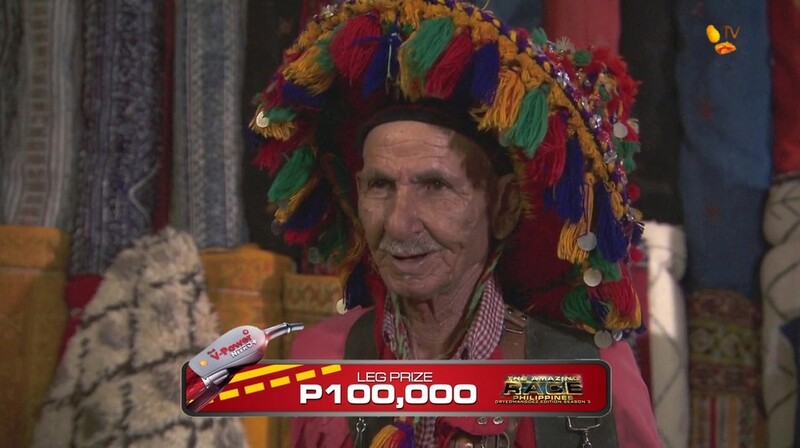 TAR25’s first Morocco Leg was really one of, if not the best Legs and episodes of TARUS in the last few years. Everything was just on point, from the tasks to the teams to the editing. It was exciting and crazy and fun. I remember immediately tweeting that TARPH should run this exact same Leg in the future, especially since Morocco is a visa-free country. Likely not gonna happen in real life. But hey, this is the DryedMangoez Edition so woohoo! I definitely want to squeeze this Leg into this last visa-free season, but flying from Asia to Morocco is actually kind of a hassle. Simplest route was Bangkok-Frankfurt-Marrakech, which actually doesn’t seem too bad as, from what I understand, Filipino citizens can transit through Frankfurt as long as they don’t leave the international terminal area. Or something. I dunno. The food carts were hilariously insane, especially with the great editing. It’s also a good equalizer to help build up the frantic tension a well. The Road Block is a good one to make Double and with the Yield right in the middle of it. And for the Detour, I swapped in a modified version of Jim & Misti’s Speed Bump over the tea serving as it could be a more interesting task, especially if several teams are digging through carpets at the same time and needing to navigate the crowded and narrow alleyways with heavy cargo. But there could also be any number of different tasks in the market area searching through different stores selling anything from hats to clothes, to carpets to glass chandeliers to tea sets, etc. Lots of great possibilities. Moving the Pit Stop away from Jemaa el-Fnaa adds a little bit of possible taxi drama at the end of the Leg. And since this Leg will run well into the evening, the train station looks amazing at night.